On day three, the sun may have risen at a little after 4:00 am, but it was not the sun that woke us up. We heard a sound not heard for three days – a car horn! 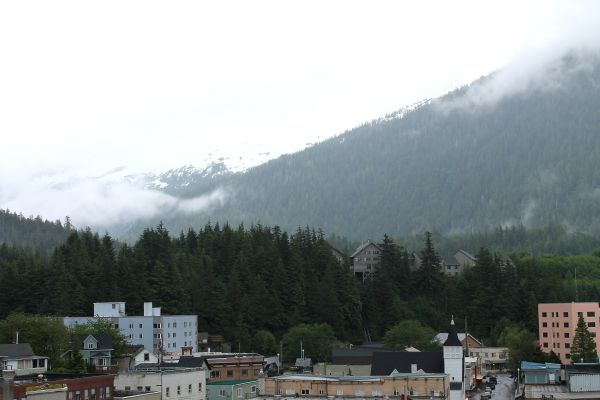 We opened the balcony curtains and Ketchikan had magically appeared overnight like Brigadoon. We were surprised and delighted that we were docked so incredibly close to the main street. This was our first view of Alaska! Ketchikan, Alaska looked like a painting. 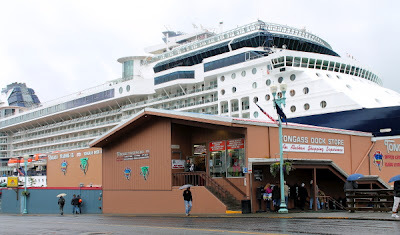 We couldn’t get dressed fast enough and walked right off the ship into the street. We turned around and the ship was so close, it looked like it would literally plow right over the store. It was a drizzly, chilly day, and to us it felt like heaven, as I had left Chicago with its 100+ degree temperatures. What would I rather observe- a steamy sidewalk or this? I’ll give you one guess. We walked around until we found a cafe that looked like where the locals ate, which was just what we wanted to find. 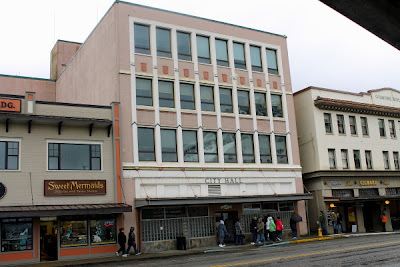 It was called “The Sweet Mermaid,” right next to City Hall. It was a small cafe with a few tables, and we observed the single cook preparing all the hot items by herself in a very tiny kitchen. The display case held muffins, cookies, cakes, and one item that caught our attention- granola rounds. They were no-bake breakfast treats with oatmeal, honey, sesame seeds, cashews, and other ingredients, formed into large rounds like a big fat cookie. We bought a couple thinking they would make a good snack for later. We realized when we ate them many hours later that we should have stockpiled them. They were fabulous. There was also a cookbook for sale at the cafe by a local author, Ladonna Gunderson, called “Salmon, Desserts, & Friends,” which is wonderful. I am looking forward to trying many of the recipes. 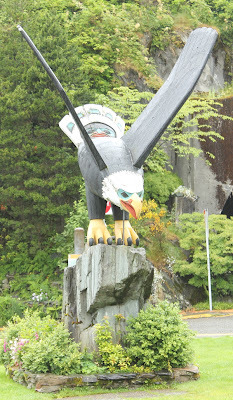 Across the street from the cafe was a bald eagle totem pole. 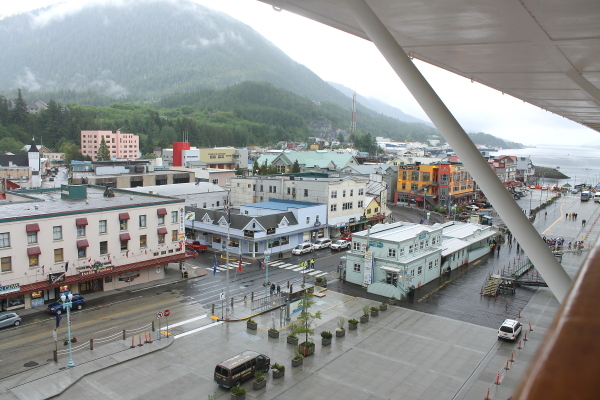 Alaska has many totem poles, as you will see, and they are all beautiful. Actually, maybe the bald eagle is not a totem pole, but it’s huge. Many of the homes had staircases like this. 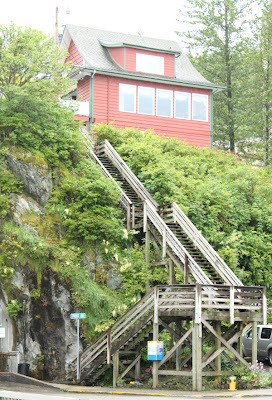 How would you like to carry groceries up those stairs? 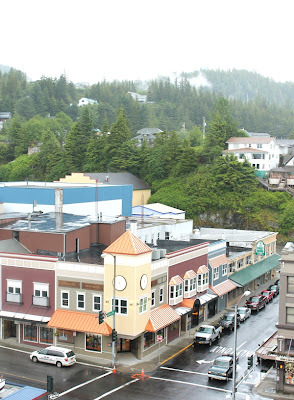 Ketchikan is also the cute Christmas ornament capital of Alaska. Since I collect Christmas ornaments, especially culinary-related ones, we went inside right away. I noticed a life-sized Santa sitting in a large chair. As I walked toward the Santa, he suddenly moved. I jumped out of my skin and said something (loudly) like – You’re real! – which caused Santa and several people around me to laugh at the silly tourist. I swear he had not moved at all before that and he looked like a real Santa with the sweetest face and a beard and hair that would be the envy of all Santas. So real that I thought he was fake. We were not about to leave until we found a bookstore, which we did down a little out-of-the way street. 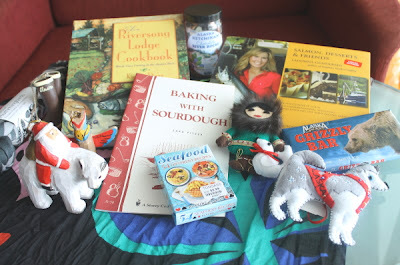 It not only had some great cookbooks, but also a lot of handmade items from local residents. Kristina and I both bought some gorgeous Alaskan scarves with native designs. We spent a lot of time in the cozy store, reading books and talking to the locals. Alaskans are so friendly. 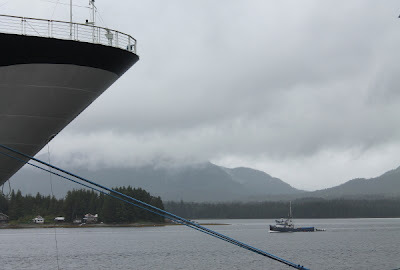 After a long day of shopping and enjoying the local food (seafood galore, obviously) we reluctantly had to return to the ship by 3:45. 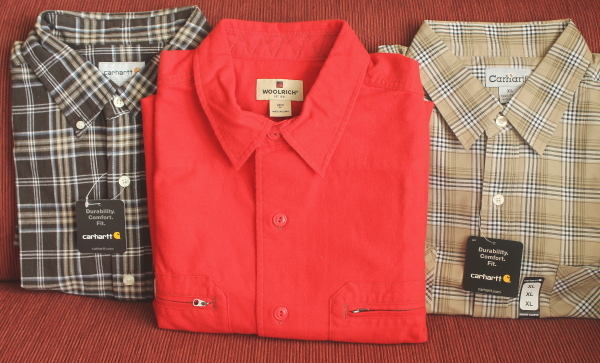 We placed our new treasures on the bed and started to go through them since we forgot what we bought during the day. Look at my stash! I love my two cookbooks, and the sourdough one is for my brother, Paul, who is the sourdough king. The native scarf is under the books. The ornaments included Santa riding a polar bear, an Alaskan husky (a gift for my friend Kim in Seattle), a darling little Eskimo girl with a baby seal, a chocolate grizzly bar for my husband, and a deck of cards with fish recipes. And of course Bill’s shirts! 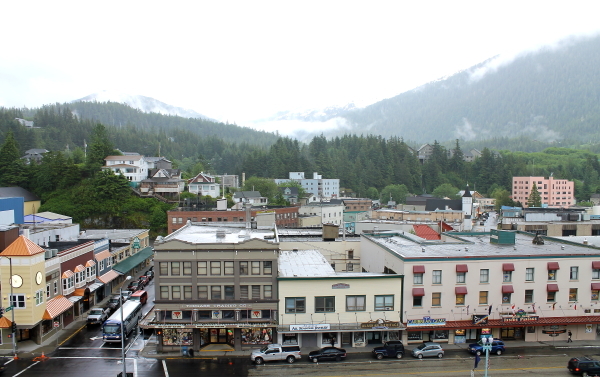 While we were shopping and exploring Ketchikan, we were sad to miss Chef John Suley’s lesson on making his mushroom risotto. However, we did mange to get the recipe, which sounds amazing. Method: To make the risotto, sweat the onions in the olive oil until translucent. Add the chopped garlic and thyme. Add the rice and stir until the rice is translucent and coated completely with the olive oil. Add salt and pepper as needed. Add the white wine and cook until reduced by half. Add half the hot chicken stock in four stages, and cook for 17 minutes until the rice is al dente. When the rice is cooked, remove from heat and fold in the butter, mascarpone, Parmesan cheese, white truffle oil and fines herbes. Place the butter in a skillet and sweat the garlic and shallots until translucent. Add the sliced mushrooms and saute for 4 minutes until cooked. Add the fines herbes and finish with the veal jus. To Plate: Spoon 4 ounces of the risotto in the center of a bowl, top with the wild mushrooms and some grated Parmesan cheese. Serve immediately. Serves 6. Kristina and I spend the next hours having dinner in our room and, what else, sitting on the balcony watching the waves. Since the sun didn’t set until 9:31, we enjoyed the daylight while it lasted, but not realizing that the sun would rise practically in the middle of the night. But that story is for tomorrow.